Future cancer drugs that are activated by light and don't cause the toxic side-effects of current chemotherapy treatments are closer to becoming a reality, thanks to new research made possible by the Monash Warwick Alliance, an intercontinental collaboration between the University of Warwick (UK) and Monash University (Australia). Led by Robbin Vernooij, a joint Ph.D. student from the Monash Warwick Alliance, fresh insight has been gained into how a pioneering platinum-based chemotherapy drug candidate – trans,trans,trans-[Pt(N3)2(OH)2(py)2] – functions when activated by light. The treatment – originally developed by Professor Peter Sadler's research group in the University of Warwick's Department of Chemistry – is an inorganic-metal compound with an unusual mechanism, which kills cancer cells in specific targeted areas, in an effort to minimize toxic side-effects on healthy tissue. Completely inactive and non-toxic in the dark, the treatment can be inserted into cancerous areas, its functions triggered only when directed light hits it – causing the compound to degrade into active platinum and releasing ligand molecules to attack cancer cells. Using an old spectroscopic technique – infrared spectroscopy – the researchers observed what happens to the structure of the compound by following the metal as well as molecules released from the compound. The researchers shone infrared light on the inorganic-metal compound in the laboratory, and measured the vibrations of its molecules as it was activated. From this, they discovered the chemical and physical properties of the compound: some of the organic ligands, which are attached to the metal atoms of the compound, become detached and are replaced with water whilst other ligands remain stable around the metal. This fresh insight into the mechanics of the treatment offers new hope that photoactive chemotherapy drug candidates, such as trans,trans,trans-[Pt(N3)2(OH)2(py)2], will progress from the laboratory to future clinical trials. '"The current short comings of most chemotherapeutic agents are unfortunately undeniable, and therefore there is ongoing effort to develop new therapies and improve our understanding of how these agents work in effort to develop not only more effective, but also more selective, therapies to reduce the burden on patients. "About half of all chemotherapy treatments for cancer current use a platinum compound, but if we can introduce new platinum compounds that avoid side-effects and are active against resistant cancers, that would be a major advance. "Photoactivated platinum compounds offer such possibilities. They do not kill cells until irradiated with light, and the light can be directed to the tumour so avoiding unwanted damage to normal tissue. "It is important that we understand how these new light-activated platinum compounds kill cancer cells. We believe they attack cancer cells in totally new ways and can combat resistance. Understanding at the molecular levels requires use of all the advanced technology that we can muster. In this case, advances have been made possible by a highly talented research student working with state-of-the-art equipment on opposite sides of the globe. 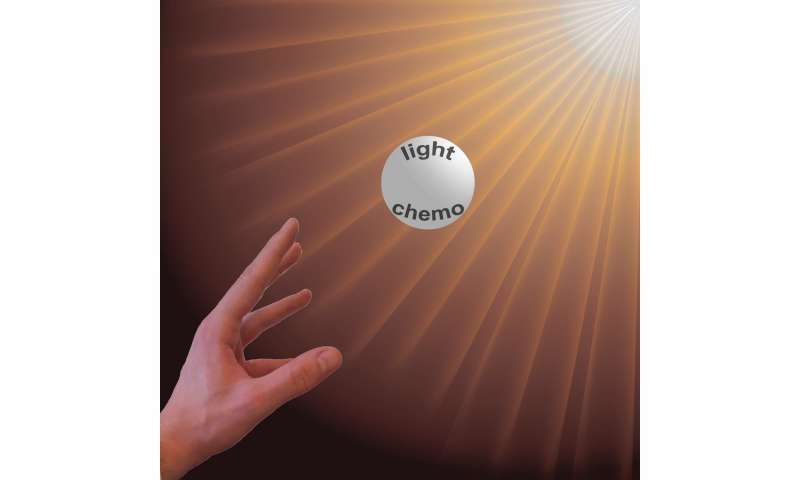 "We hope that new approaches involving the combination of light and chemotherapy can play a role in combatting the current short comings of cancer therapy and help to save lives." The majority of cancer patients who undergo chemotherapy treatment currently receive a platinum-based compound, such as cisplatin. These therapies were developed over half a century ago, and cause toxic side-effects in patients, attacking healthy cells as well as cancerous ones. There is also a growing resistance to more traditional cancer therapies, so new treatments are desperately required.